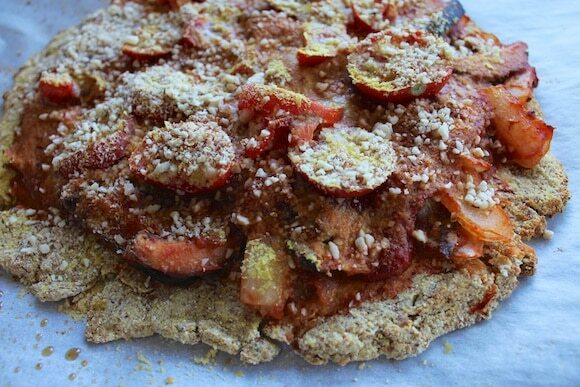 This homemade cauliflower crust pizza is gluten-free, and vegan. It’s a delicious healthy dinner. Did someone say pizza?!? I don’t eat gluten and so I haven’t had a regular pizza in many years. Somewhere from the back of my mind, however, I recalled reading on the blogosphere that a crust could be made from cauliflower. I know, sounds crazy, but go with me on this one. 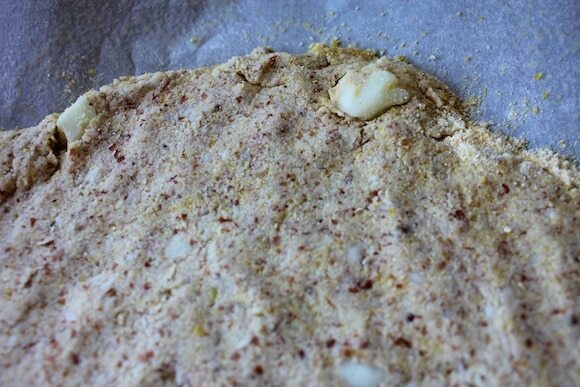 The ingredients for the crust are simple: cauliflower, onion, garlic, almond flour, flax meal, baking powder, garbanzo bean flour, and corn meal. I then sauteed the cauliflower bits with some onion and garlic for flavor and put it in a large bowl. Oh yeah, baby, this was as good as any “real” pizza that I remember eating. 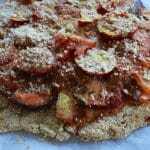 This homemade cauliflower crust pizza is gluten-free and vegan! It makes pizza healthy! Preheat your oven to 375 degrees F. Place a piece of parchment paper on a baking sheet and spray lightly with nonstick cooking spray. 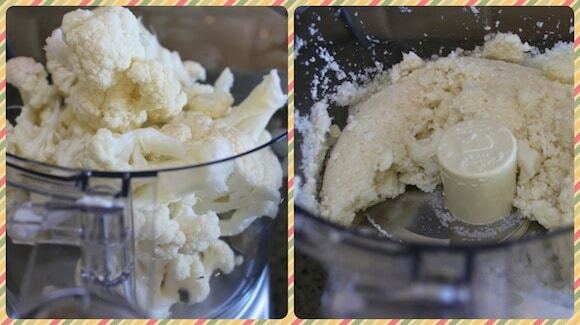 Place the cauliflower florets into a food processor and process until completely broken down into the consistency of rice. Heat the oil in a large skillet and saute the cauliflower “rice,” onion, and garlic for several minutes or until softened. Set aside to cool. 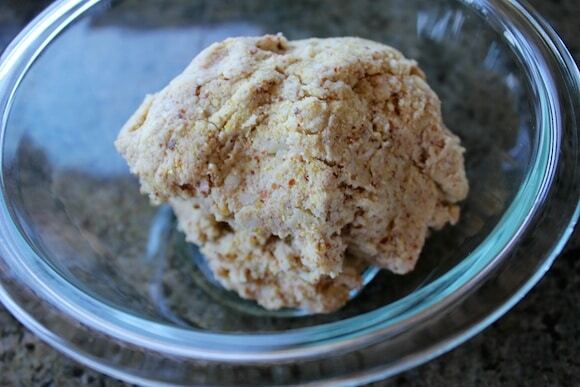 In a large bowl, combine the cauliflower mixture, almond flour, flax meal, baking powder, and garbanzo bean flour. Using your hands, form the mixture into a dough ball and then flatten out on the baking sheet into a pizza shape. You can either make one large pizza or two medium ones. Bake the crust for 20 minutes or until it starts to become crisp on the outside. Remove from the oven and add toppings. Bake again at 375 degrees for 15 minutes. Serve hot. You can refrigerate half of the dough for up to several days if you want to make one at a time. Great post! Congratulations again on your cancer-free milestone. About the pizza crust — do you think it would work if I used thawed frozen cauliflower? I was thinking the same thing about the sogginess. Thanks for replying! 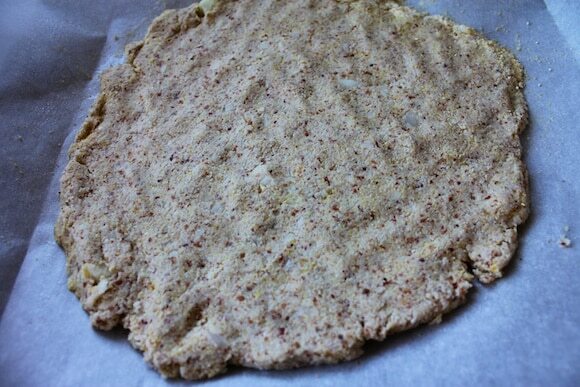 Add nutritional yeast flakes and Italian herbs to the dough. It takes the already stunning crust to a new level. Thanks for the recipe. Keep living plant strong. I just recently started Dr. Furhman’s Eat to Live plan and started following your blog. I am really enjoying it…especially the “what I ate” emails. I love the app and look forward to more recipes being added. I am venturing out this week to try the cinnamon raisin muffins…my first baking experience since changing the way I eat. This pizza will be in my near future. Great news, Carrie! Congratulations, it’s wonderful to hear, and it must be mind blowing to say: 6 months cancer free! You know what I haven’t had pizza, since I went vegan, so this will be a birthday treat for me and my husband hthis week! Is half of the dough enough for two? Salad is a must in our household!!! Carrie, we enjoyed the pizza tonight, even though the crust got somewhat soft from the tomato sauce and tomatoes. The other half of the dough I’ll just bake and then put some raw vegetables and the almond parmesan cheese on 🙂 Thanks for the recipe! Mmmm yea, I saw those coconut cups. I can’t wait to try them – I’m on a strict cleanse right now, but have the recipe bookmarked to try it out soon. Congrats on your ultrasound results!!!!! So happy for you =) Happy 6 months. You know, every year I plan a super fun day to celebrate being cancer free on the anniversary of my surgery – it makes for a fun day. Oh I can’t wait to try your cauliflower pizza! I tried making one once and it was an epic failure. I usually just make pizza on a food for life rice wrap, but this looks so good! Congratulations Carrie on being cancer free. What fantastic news. I can’t believe it’s been 6 months already. I was planning to make those coconut cups too maybe with some mint and sweetener. They look so easy. I have a rubbish food processor so might try my vitamix. Great pizza. I recently started eating wheat/gluten again after a long time away from it. I seem to tolerate it OK but it’s too hard to tell during my pregnancy as I’m always tired so I’ll have to wait until afterwards for more experiments. It’s so nice eating bread again but think my toddler has a wheat intolerance so may be short lived. Congratulations on Vegan Delish. It’s doing so well! Congrats! What amazing news! I hope you found time to celebrate 🙂 I have never had cauliflower pizza but really want to try it! This looks delicious. Hi Carrie! I have recently started following your blog after reading “Eat to Live” and it has made my new-found way of life SO much easier thanks to your recipes!! I was living off of salad and frozen/steamed veggies because I was afraid the vegan recipes were going to be gross and complicated. I noticed your app was for iPhone only…do you have any plans to make it available on the Android Google play store any time in the neat future? This would make vegan cooking even easier for me!! BTw… CONGRATS on being Cancer-free!! Congrats on your cancer un-diagnosis! I’m a huge fan of making recipes as simple as possible, so I wanted to let you know that you can make the cauliflower crust pizza without cooking the cauliflower first. We did that last night and it worked wonderfully! Hi Carry! Thanks for the note, I wondered if sautéing the cauliflower was a necessary step. I’m glad that worked for you and I’ll try it that way next time for sure! Congratulations on your clean bill of health, Carrie! You have definitely earned it through optimal nutrition!! I so admire the courage and cheery determination you have shown as we have all followed you on your journey. 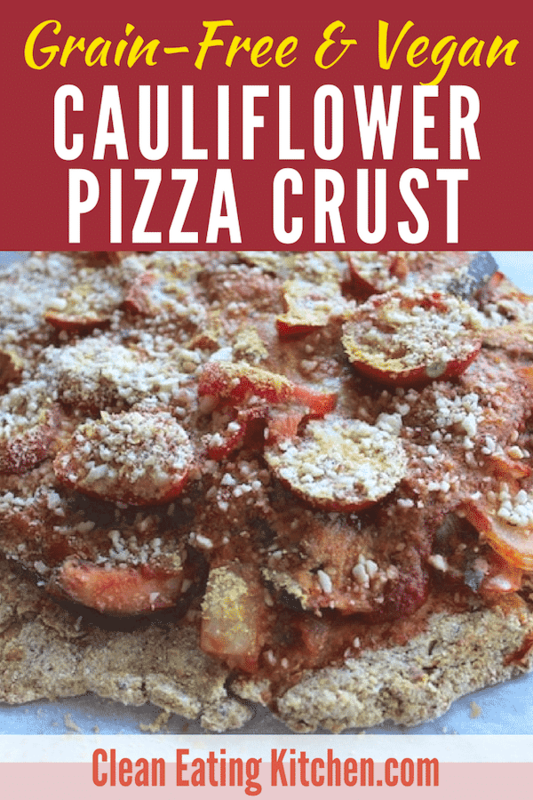 And by the way, the cauliflower pizza crust looks delish — I look forward to having it on my Vegan Delish and trying it out! yum!!! also – I LOVE your shirt 🙂 congratulations on being cancer-free! What a blessing. Praying for a continued clean bill of health! no way! that’s awesome. great find! Hooray for the good news…can’t wait to make this crust. YAY! I am so happy that your check up went well and that you are free of cancer. I hope the intermittent check ups get easier with time. You do a great job taking care of yourself which I’m sure helps! You look great in that blouse and I loved your nature pictures. Makes me want to go on a hike! Thanks, Rebecca!!! I have been thinking about you a lot lately and will e-mail you soon to catch up. All is good here, just busy. Hope you are well. I’m sending you a big hug! Pinned it! Congrats, on Cancer Free!!!!! So happy that your check up went well! Great news! I need to make my own coconut butter! That pizza looks amazing. The pizza looks so good. I have to buy a food processor. Hey, that’s awesome news Carrie!! I’m so happy for you and Alan, on your wonderful clean bill of health. You deserve it! Great news! Yay Carrie, I am so happy to read your good news! That’s really wonderful. I hope you are well and that you will soon find the optimal medication for you. Yay. And if you havnt tried them yet, they make these silicon strips to reduce scars. You can get them in the drug store Worked amazing on my thyroid scar. My cousin used them on her tracheotomy scar but she didn’t cover the whole thing and we could really see the difference where she used them and where she didn’t. You just put them on like a band aid over the scar. But they are clear. It’s totally worth it!! Congratulations on your report from the doctor! I’m so happy to hear this! And the pizza looks amazing – can’t wait to try it soon! Congratulations on being cancer-free! What a wonderful, wonderful piece of news. So very wonderful. That is such a great idea, I have never even considered using cauliflower for a pizza crust but have used it for so many other recipes! I have to try this asap!! Thanks and congrats on your diagnosis!! Thank you, Gabby. I’m hugely relieved and appreciate your sweet note. Hugs!!! GOOD FOR YOU!!! What beautiful news. And this Cauliflower Crust sounds delicious to boot! For GF crusts, I like Vegan Richa’s Oat Focaccia crust too, which doesn’t have cauliflower but I guess it’s never a bad idea to add a cruciferous veggie wherever you can! Good luck with your schoolwork! Wahoo! I am so excited to hear you are 6 months cancer free! I have been reading your blog for a while now and dipping my toes into ETL for even longer, but this is the first time I’ve commented. It’s funny how this internet thing works . . . I feel like you are a good friend, but you have no idea who I am! I want to let you know that your example has been so inspiring to me, and I am ready to commit 100% to this lifestyle change. I am joining your summer challenge and I’m so excited about it! This is something I’ve been longing to do for so long, and now just feels like the right time. It will be amazing to have such a great support group! In fact I’ve even signed up for Dr. Fuhrman’s getaway in San Diego, so there is no turning back now 🙂 I can’t wait to see how healthy I can get in the 9 weeks until the getaway and look forward to meeting you there! I’ll post on facebook more about my goals for the challenge, but I want to thank you for this opportunity. The time and effort you put into your blog make a difference for so many people, those who comment and those who are just lurking, as I’ve been for so long! You are an inspiration! PS – That pizza looks amazing! Can’t wait to try it, and I’m so glad the recipe is in the app! I want to have some of your coconut cups so much! they look so yummy! Ok. I’m gonna see if I can make them.. fingers crossed! Thanks for the invite, Erin. I’ve added my link! I looooove this idea for 5-Ingredient Mondays. 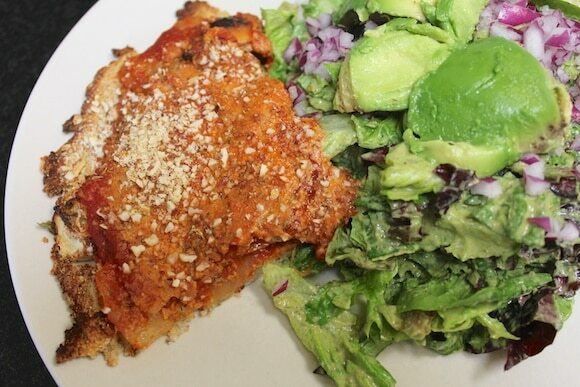 Thanks for linking this recipe up to 5-Ingredient Mondays. I’m featuring it this week as one of my favourite submissions 🙂 Hope to see you back this week! 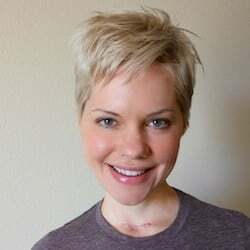 I love those words: Cancer Free! My mom received her five year mark for being cancer free since her double mastectomy. Thank you for sharing; that is such great news! First of all CONGRATULATIONS on a clean bill of health, what wonderful news! Next Monday I go in for my yearly results with my oncologist…crossing my fingers! Secondly, I am LOVING the look and ingredients of this pizza crust, I will definitely give it a try! Thank you! Thanks, Chris and I am sending you positive thoughts on your upcoming appointment. Oh and Congrats on your ultra successful app! Love to see fellow vegans spread the love and yumminess. The beach pictures you posted looks like my area. Any chance those photos were from Grover Beach, Ca? And yeah, this pizza looks ridonk!!!! Thanks, Rachael! I’ve been trying to update some old posts with recipes that I still like, but I’m glad you read it and sent me such a sweet message. XOXO! Great idea for a pizza crust. If you want to make homemade crust, this is the recipe!